I find this post to be a little too much like Day 14 as my celebrity crush also happens to be on my favorite show. 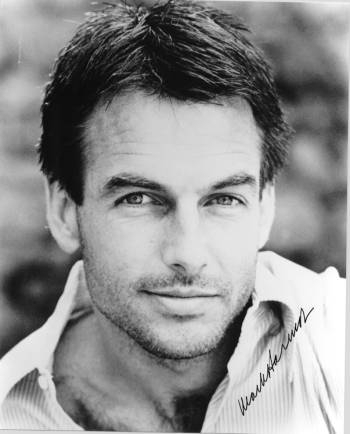 I mean does it get any hotter than Mark Harmon? John thinks its weird that I seem to crush on older guys, especially since my husband is younger than I am (only a year and a half but still). I just joke that he is the only young guy I like just as I am the only white girl he likes (his celebrity crushes include Catherine Zeta Jones, Penelope Cruz, and Selma Hayak). I thought about choosing someone else since I just posted about NCIS the other day but hey, I’m all about being real and MH is most definitely my biggest celebrity crush! Oh my! That picture of him younger is so adorable!! He is most definitely a looker! Although that pic of MH as a younger guy is HOT!!! Ryan Gosling is definitely a hottie! We watched Crazy Stupid Love yesterday and until that movie, I had no idea just how buff he is! Weirdly enough, I’m watching NCIS right now! Oh yes, he is indeed a cutie pie. I don’t watch it but I have been known to linger in the doorway if DD is watching it & he’s on LOL!